Google employees, who walked off the job to protest the internet company’s lenient treatment of executives accused of sexual misconduct, leave after attending a protest rally on Thursday, Nov. 1, 2018, in New York. Employees staged walkouts at offices from Tokyo to Singapore to London. A group of Google workers is ramping up the fight to eliminate the tech industry’s use of unfair forced arbitration agreements. In 2018, we saw workers bravely and impressively organize and stand up to their leaders and decisionmakers, calling for change. Activism among tech employees hit a dramatic climax in early November, when thousands of Google workers held what may be the largest collective tech demonstration to date, issuing a number of demands, including an end to forced arbitration agreements. Now, a campaign that kicks off this week aims to eradicate those agreements across the tech industry. Googlers for Ending Forced Arbitration, a group dedicated to ending forced arbitration spearheaded by organizers of last year’s Google Walkout, will launch a social media blitz on Tuesday, the group announced in a Medium post today. Every hour on Twitter tomorrow from 9am to 6pm ET, the group will share facts about the effects forced arbitration has on tech workers, as well as firsthand accounts of people impacted by forced arbitration and interviews with experts every half hour on Instagram. Forced arbitration requires a worker to settle a dispute privately behind closed doors rather than in a public trial. This practice, which is not uncommon across the tech industry and only recently saw any slight changes due to mounting public pressure, is a powerful mechanism employers can use to keep internal issues under wraps. The November 1 Google Walkout followed the New York Times reporting that several high-level executives, including Android co-creator Andy Rubin, were accused of sexual misconduct but still received exorbitant exit packages. After the walkout, Google said it had eliminated forced arbitration—but only for sexual harassment claims. That change doesn’t include discrimination cases, and it doesn’t apply to Google’s sprawling contractor workforce. The company also still prohibits employees from pursuing class-action lawsuits. According to the activists, there may not have even been much improvement at all. “The change yielded a win in the headlines, but provided no meaningful gains for worker equity, nor any actual change in employee contracts or future offer letters,” Googlers wrote in the Medium post on Monday. They also claim that, at the time of writing the post, Google still included its old arbitration policy in offer letters. In December, Google employees published a statement calling for an end to forced arbitration agreements industrywide. We’ve reached out to Google regarding the organizers’ claim that the company continues to send out offer letters with the forced arbitration clause included and for comment on the activists’ campaign. 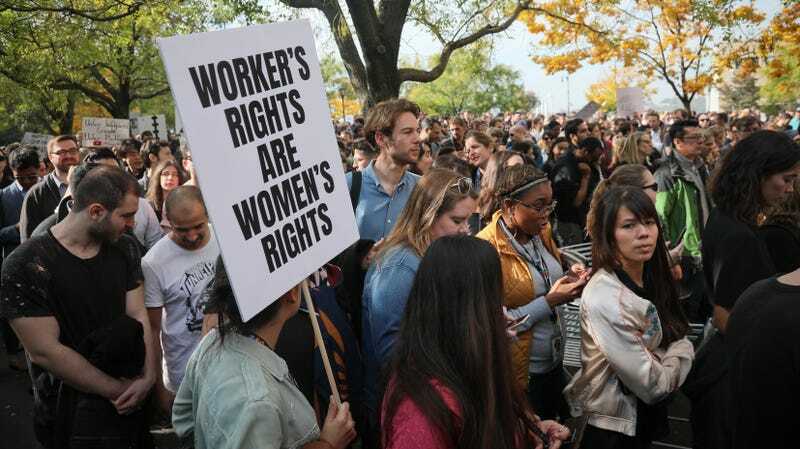 Tanuja Gupta, a lead organizer from the Google walkout and one of the women spearheading the movement to end forced arbitration, told Gizmodo in an email that she, along with Google staff linguist Vicki Tardif, received a lot of questions around how the practice works from colleagues and other tech workers in their cities.